Year of the Rooster ! A most Happy and Prosperous and Fortunate New Year to all my Chinese friends! Many years ago - too many - I got a recipe from Chef Rose Cheng that set the basis for this dish. I have always come to this dish for a mid-winter spark. I love eggplant - in all it's manifestations. This dish is one of my absolute favorites and one I do get requests for from close friends. Since I've been cooking (mostly Cantonese) Chinese dishes since I was 14, and enjoying all forms of Chinese cooking, I do have the necessary equipment and keep the condiments on hand. I like to say that I have "3 woks and 4 cleavers parked in my kitchen". Follow this recipe. The photos accompanying are for a larger quantity than this recipe calls for, but I did want to show you, step-by-step, the process. If you have questions about any of the condiments, just message me - you know I'll get back to you! 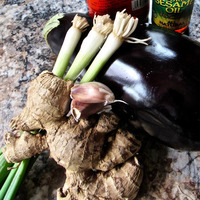 TIP: Gather all your ingredients before you begin. Chinese cooking is quick and requires high heat and focused motion. You do not want to be running to the pantry or the refrigerator once you get the oil hot. Measure out all the bottled ingredients in groups as follows.